As it seems that our nation drifts towards a sense of hostility with the Nation of Wilden, I would like to commend the Department of Defense under Secretary _LaughingCoder_ for his able leadership and more than excellent command. I find it more than necessary to ponder our nation's future in regards to military conflict and it brings much relief to me to know that the head of basically our entire nation's defense is at the hands of a very competent individual. In times like these where armed conflict is not a nightmare but a mere reality, in times where the defense of the people against foreign enemies has to be considered seriously, its times like these where our nation requires capable leadership to lead our defenses against all threats, and I am more than glad to say that Secretary Coder is such the person to fill those shoes. I would like to extend a warm sense of gratitude towards the Department of Defense as well as Secretary Coder for the way things are run currently. 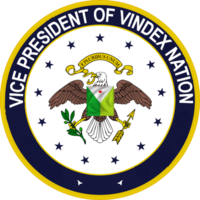 I will not lie and say that Vinnish Peace is permanently guaranteed, but I will say that with the deterrence that our defense gives, it surely is secure for the time being. Under Secretary Coder, we have seen tremendous growth within our navy as well as progress within the army. With the Vinnish Navy growing tremendously in size and with the further organization of our ground forces, I find that our military has the strength to truly be respected across the lands of our great nation and beyond. On behalf of my office, I would like to officially thank Secretary Coder's efforts as well as his actions. As I wrap my statement up and state my thankfulness to Secretary Coder, I begin to think of hopefulness to the future of this nation. That under the leadership of a competent head of our nation's defense, we can begin to worry on other issues than what our foreign tensions might be. It reveals to me that the problems that affect our nation will no longer be foreign, that they will be within us. We might not be able to find an honorable solution on the foreign side, but considering that, that is all but guaranteed, it gives us the time to fix problems tearing us up as a people, and that is a gift I must truly thank Secretary Coder for.